After tornadoes wiped out many homes in Illinois and the Midwest over the weekend, the victims now take on the task of sorting through the rubble of their homes and belongings. NBC's Dylan Dreyer reports. A deadly storm system which ripped through the Midwest on Sunday included the two most powerful November tornadoes that far north for more than 100 years, an expert said Tuesday. One of the two EF4 tornadoes recorded on Sunday devastated large parts of Washington, Ill., a town of 16,000 people some 140 miles from Chicago. This tornado -- seen here two miles west of Flatville, Ill. -- damaged farm buildings and homes on its way to Gifford, Ill., where many houses were devastated. The other, also an EF4, killed an elderly man and his sister when it struck their farmhouse in near Nashville, Ill.
“Primarily in November tornadoes that far north just do not happen,” said Kevin Roth, lead meteorologist at The Weather Channel. Roth said the last time tornadoes that strong had been reported in the area in November was when a cold front hit the Great Lakes on November 11 and 12, 1911. This caused dramatic temperature drops, and one EF4 tornado which killed nine people. Though the powerful line of thunderstorms and tornadoes howled across 12 states Sunday, flattening neighborhoods in minutes, the death toll stood at just eight. The preliminary tornado count from the storm system stood at 59 – 25 confirmed and 34 unconfirmed – on Monday night, said Dr. Greg Forbes, severe weather expert at The Weather Channel. There were 101 tornado warnings in Illinois on Sunday, or more than the state has seen in every November combined since 1986. 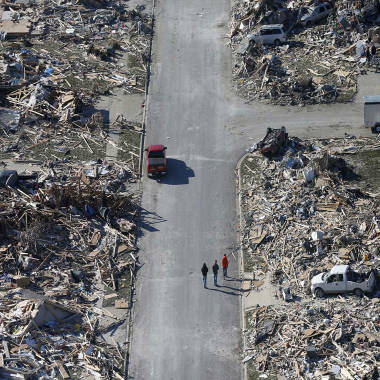 A storm system spun off multiple tornadoes killing several people and flattening an entire neighborhood. According to The Weather Channel, the EF4 tornado which devastated parts of Washington, Ill., on Sunday had windspeeds up to 200 mph, verging on the highest EF5 category. Besides the reported tornadoes, there were 358 reports of damaging wind and 40 reports of large hail, said Rich Thompson, a lead forecaster with the weather service’s Storm Prediction Center in Norman, Okla. Forecasters' uncannily accurate predictions, combined with television and radio warnings, text-message alerts and storm sirens, almost certainly saved lives. The Ekenas emerged to find “just flatness,” and then the destruction beyond, he said. The mayor of Washington, Gary Manier, said the devastation there was “unbelievable.” He said that 250 to 500 houses were destroyed in the town. Residents tell their stories of how they survived the deadly Midwestern tornadoes. NBC's Kevin Tibbles reports. "Nobody has anything left," Nancy Rampy, of Washington, Ill., told NBC Chicago. "It's all gone. It's just awful." One homeowner, Guida Scheer, had pulled out a Bible from the rubble. Despite Sunday's destruction, 2013 has been a relatively mild year for twisters in the U.S., with the number of twisters running at or near record lows. So far this year, there have been 886 preliminary reports of tornadoes, compared with about 1,400 preliminary reports usually received by the weather service office by mid-November. Similar slow years were 1987 and 1989.